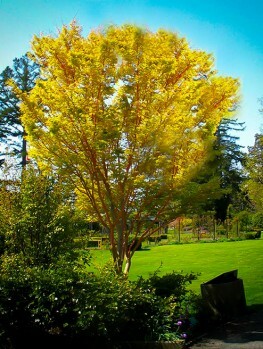 If you’ve looked in envy at beautiful Japanese Maples but thought you lived in too cold an area, think again. Even in eastern Canada you will see the glorious Bloodgood Japanese Maple thriving, hardy to minus 30. A whole zone tougher than its relatives, this red-leafed maple has delicate fingered leaves that emerge red, turn a rich burgundy all summer than end with crimson shades in fall. Making a small, upright tree, this special Japanese Maple will thrive in shade as well as cold and be a delight at all seasons. 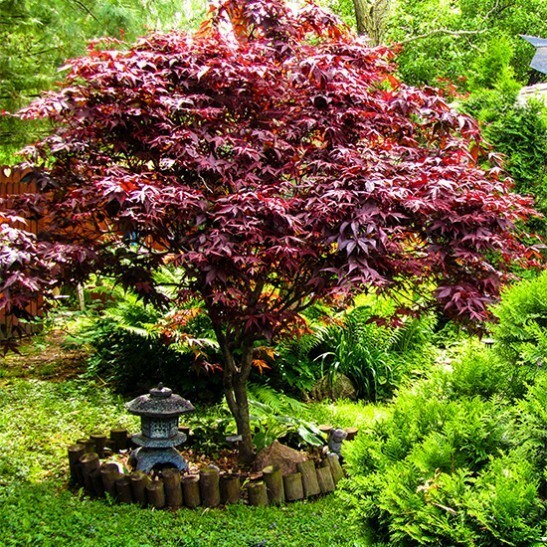 Whether you grow it because you live in a colder region, or because you want a trouble-free Japanese maple to grace your yard, this burgundy beauty will soon grow into a small tree of great delicacy, perfect for any restful corner of your garden or a special eastern-themed design too. The Bloodgood Japanese Maple is a great ornamental tree. The rich reds of this cultivar begin with the first buds in spring, which dapple the gray-brown twigs. Next, begin the leaves. The seven-nodes of the Bloodgood cultivar provide a sharp shape patterned with the cascading silhouette of the tree itself. 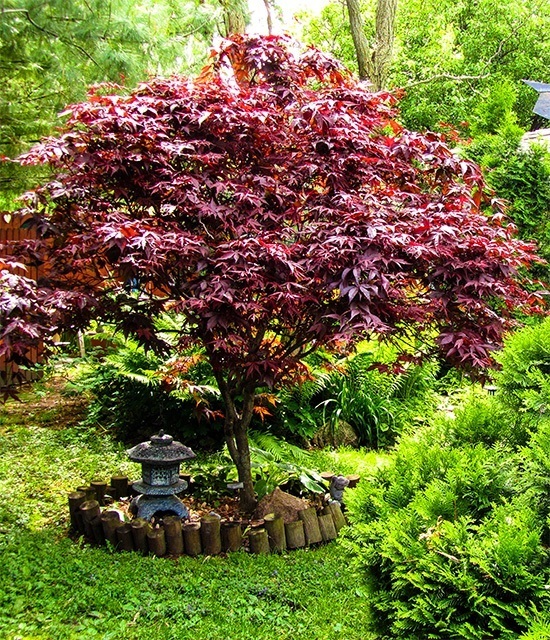 Many gardeners choose to plant the Bloodgood Japanese Maple as an accent plant, as it draws attention with its coloring. Paired alongside a dark green backdrop, the Bloodgood Japanese Maple’s red provides a stark aesthetic contrast. 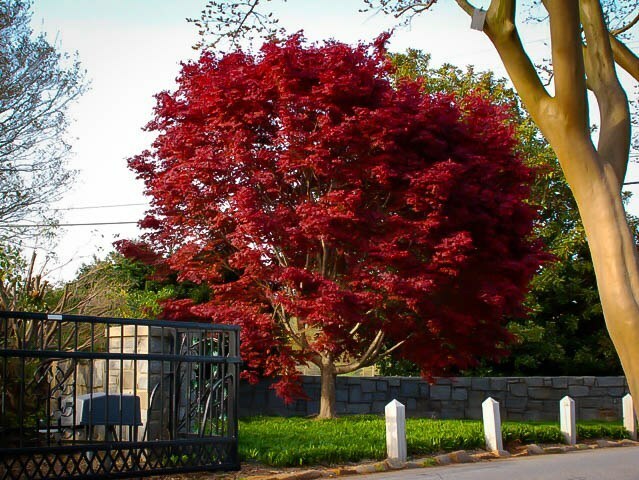 Although Bloodgood Maples can reach 15 feet in height, some landscapers choose to prune the Maple to a more desirable height, allowing the tree to fit into small garden nooks and crannies. This tree has a slow to moderate growth rate; growing between 1 and 2 feet per year. The growth rate of the Bloodgood Japanese Maple depends a great deal on location, watering, and soil conditions. To achieve faster growth, heavy watering and fertilizer can be used; however, opting to allow the Bloodgood to grow at its more slower, more natural pace will ensure proper branching. 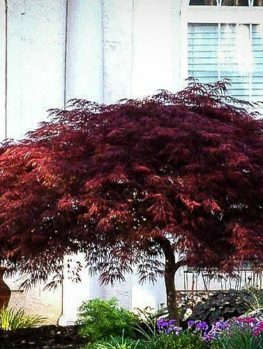 When mature, the Bloodgood Japanese Maple Tree will reach between 12 and 18 feet in height, though it can easily be cut-back to a shorter height if preferred. The tree will also reach between 15 and 25 feet wide, sometimes almost doubling its height. The Bloodgood Japanese Maple Tree is only one of hundreds of charming ornamental trees, so what makes this variety special? First of all, the color! The Bloodgood is a rich scarlet red, and this bold color is what causes the Bloodgood Japanese Maple Tree to stand out from the crowd. The tree’s bold burgundy contrasts perfectly with garden greenery, causing a visual sensation. 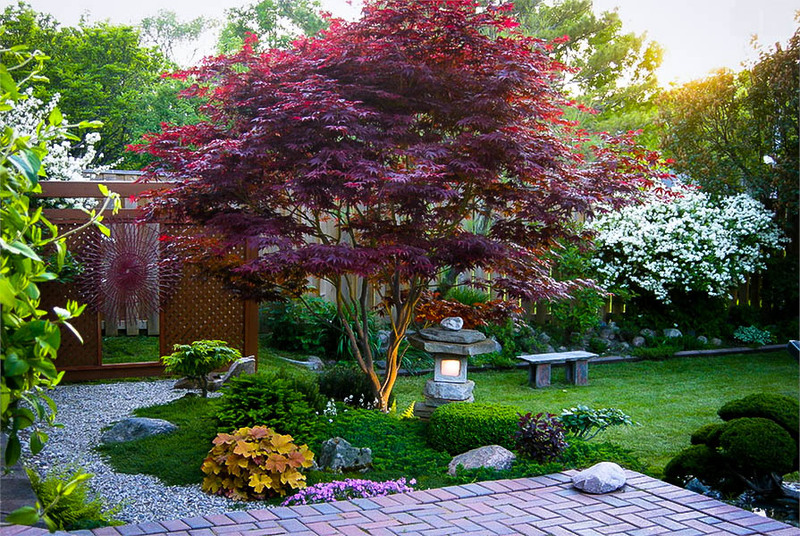 Seasoned gardeners suggest pairing the Bloodgood Japanese Maple with grasses and evergreen trees, thereby recreating an Asian-style garden. The Bloodgood’s preference for a moist soil means a meandering stream makes a great partner to its beauty. 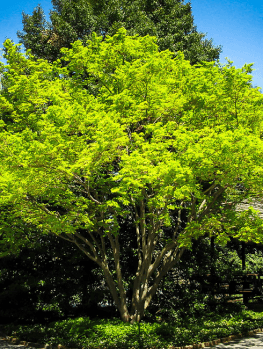 For many gardeners, fast-growing trees are preferred, yet the moderate growth of the Bloodgood Japanese Maple makes it easier to manage and control. Shaping through pruning becomes more manageable, and the tree itself tends to have a more natural shape. The cascading, or weeping, quality is assigned to Bloodgoods, which curve their boughs downward to provide pleasant shade and color. 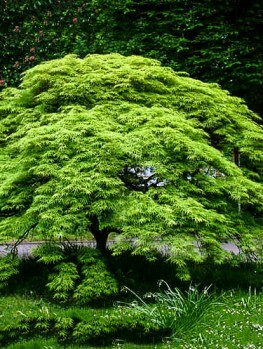 Furthermore, the Bloodgood Japanese Maple is drought tolerant. 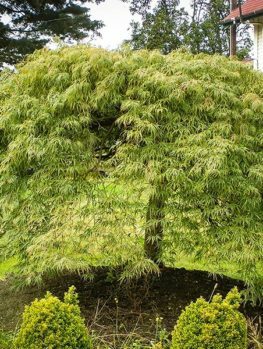 Even though moderate watering is preferred by Japanese Maples in general, the Bloodgood can withstand several days without water. This is an enormous benefit to those gardeners who live in drought-prone areas, such as the southwest. Simply water the tree once a week! The Bloodgood Japanese Maple has also been awarded the prestigious Royal Horticultural Society’s Award of Garden Merit, which identifies the best garden plants and trees. In order to qualify for such an award, the Bloodgood cultivar had to display availability, value in the garden scene, hardy constitution, no need for specialized care, no pest or disease susceptibility, and minimal reversion. Only the best species earn the coveted award, and the Bloodgood Japanese Maple is one of them! Beware! 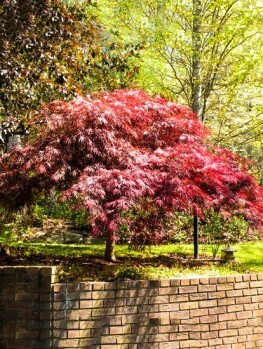 There are false Bloodgood Japanese Maple Trees available on the open market. These trees are bare-rooted and grown from seed, making them less colorful and less likely to display the traits so aligned with the Bloodgood. Sometimes nurseries will even replace the Bloodgood with a cheaper variety to cut costs! These replacements frequently lack the very qualities for which homeowners flock to the Bloodgood. 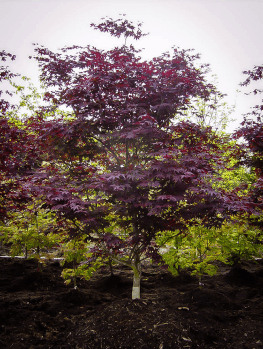 The Tree Center ensures the Bloodgood Japanese Maple Tree you purchase will be of the highest quality. Carefully educated arborists and botanists work to stimulate the growth of the Bloodgood sapling, which when partnered with your proper planting and daily care equal beautiful growth. Do not settle for less! Visit The Tree Center to buy your Bloodgood, and rest assured you will be making a low-cost investment in a great tree! 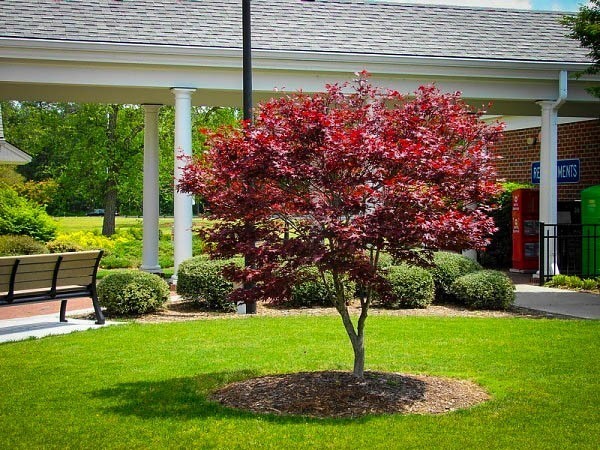 The best way to ensure successful growth of the Bloodgood Japanese Maple Tree is to plant the tree properly. First, find a location in either the full sun or partial shade; however, they prefer partial shade. This will also translate to richer red leaves. Although the Bloodgood is relatively adaptable to various soils, it prefers moist, well-draining soil. Dig a hole three times as wide as the Bloodgood’s root ball. Do not worry too much about depth. The root ball can even protrude from the soil about 1 inch, since the tree will settle over time. Hold the tree vertically in the hole while backfilling with soil and water. Once the tree is firmly in the hole, add mulch and water the tree heavily. Continue to monitor, providing water once a week. The Bloodgood Japanese Maple Tree grows well in USDA Hardiness Zones 5-9. They prefer well-drained soil that retains moisture. 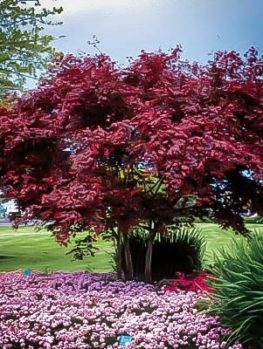 The Bloodgood Japanese Maple Tree does not require fertilizer; however, if your soil is lacking in nutrient matter, a slow release well-balanced fertilizer (10-10-10) can be applied once in the spring to help prompt tree growth. Mulch is a great tool to use when planting Japanese Maples. Simply apply a 3-inch layer of natural mulch, such as those made of wood chips or bark, in a 3-foot radius around the tree’s base. Water the mulch, which will help conserve water and, when decomposed, add nutrient matter to the soil. You can find a wide range of Bloodgood Japanese Maple Trees at The Tree Center, which carries different sizes to meet your gardening needs. The best of the breed is only available here. But hurry and act fast because the award-winning Bloodgood Japanese Maple is popular and supplies are limited. Our stock is always changing, so visit The Tree Center today to buy your Bloodgood Japanese Maple!